Located 25 minutes from Murcia airport and 45 minutes from Alicante airport, spend a holiday in a sunny, idyllic and quiet. The beautiful private pool is located next to the apartment, the beaches about 5 minutes, 5 golf courses nearby, cycling or walking along the canal and countless culinary discoveries (Spanish restaurants, Argentine, Asian , Indian, French). In short, an enchanting stay. Fully equipped kitchen: electric hob and oven, microwave, dishwasher, refrigerator, freezer, coffee percolator, toaster, electric juicer, washing machine, ironing board and iron. 2 terraces (1 in the shade and the other bordering the pool in the south facing sun). 2 other community pools in front of the apartment. It is open to the public from Monday to Sunday from 10h to 22h without interruption (with the exception of the cinema and the area of ​​recreation and restoration that remain open later). The Club House Las Ramblas is the perfect place to enjoy a drink and eat local and international cuisine. It is located only 300m from the apartment. This place has a lot to offer both from the point of view of restaurants and bars. The nearest are all about 15 minutes walk from the apartment at a place called La Fuente. In La Fuente you will find 15 restaurants and 4 bars. By car 2 minutes! You are not far from Cabo Roig, La Zenia and Villamartin and Torrevieja (10 minutes by car). Not far from Las Ramblas, you can visit many famous places: Murcia, Elche, Alicante, Orihuela, Cartagena. Water sports are obviously passable. 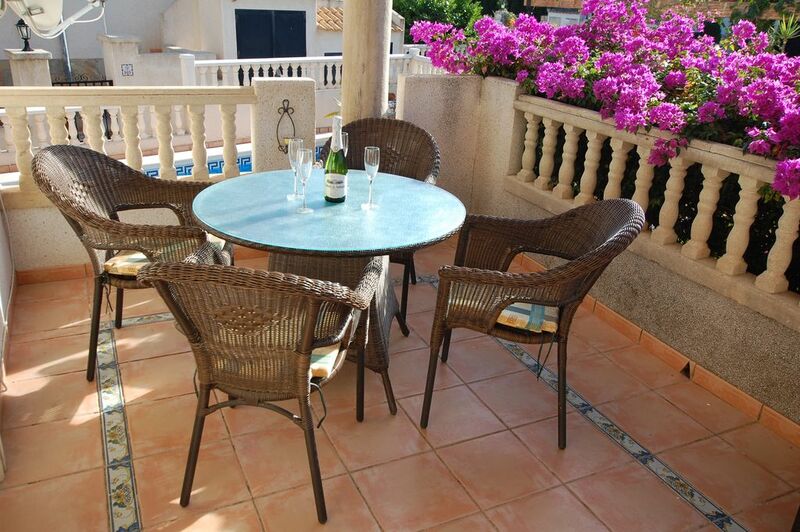 The popular Mar Menor area is around 15 minutes away. Many local bars and restaurants offer traditional cuisine. This place is well known for its lagoon and for the temperature of its water: 19 ° in winter. There are other attractions in the area: Aquapolis, Aquapark Waterworld, Go Kart Track, Horse Riding, Painball, Sailing, Rio Safari ... so many activities you can enjoy during your stay. The Costa Blanca is an international destination for its many beautiful golf courses. Near the sea and surrounded by mountains, there are no less than 21 courtyards in the area. The apartment is located less than five minutes walk from the 18-hole Golf Las Ramblas. The golf courses of Campoamor, Villamartin and Las Colinas (award 2016 of the most beautiful golf in Spain) are about 5 minutes by car. A little further about 15 minutes you will find the brand new and beautiful course of La Finca. The apartment was spotless, well maintained just stunning. The lady that greeted us was so nice. A big thank you to you for your kind comments. We do our best to make your stay as good as possible. See you soon. We enjoyed our stay. The appartement was verry Nice, welk cleaned and stille cool. Only for us, the area wasn't as we expected. No local villages, only a lot of tourist attractions. But as we drove a little we found some Nice places. So we had a lovely week. We absolutely loved staying in your wonderful apartment. We arrived home today and we really felt sad about leaving. Your place is fantastic, so well equipped, there really isn’t anything missing and more than we could have hoped for. The pool is amazing and we used this a lot. We also used the communal pools which were empty every time! Such a peaceful and relaxing atmosphere. Our daughter (aged nearly 3) grew in confidence in the water and said this was the “best holiday”. We had a rental car and felt that was required and we were able to visit all the beautiful beaches in the area. We also used the golf restaurant which was lovely and very reasonably priced. You have a wonderful holiday home and we would highly recommend to all our friends and family. We would love to re visit in the future. Thank you again. You’ve been helpful and quick to respond throughout. Ik schrijf liever geen goede recensie over dit appartement, omdat ik bang ben dat ik dan volgend jaar misgrijp, het was geweldig. De woning heeft werkelijk alles wat je nodig hebt voor een fijne vakantie, kan niet verzinnen wat er zou ontbreken. Ligt aan een doodlopende straat op een paar minuten lopen van het clubhuis van de golfbaan. Heeft een fijn terras en zwembad, en is volledig uitgerust, met goede bedden en een volledig ingerichte keuken, ik zeg een aanrader. Un nettoyage obligatoire de fin de séjour de 60€ est demandé aux vacanciers au moment de la remise des clés. Les draps de lit et serviettes sont fournis gracieusement. Les lits sont faits à votre arrivée. Une caution de 200€ est à remettre également à ce moment là. Bei der Schlüsselübergabe ist eine obligatorische Endreinigungsgebühr in Höhe von 60 € zu zahlen. Bettwäsche und Handtücher werden kostenlos zur Verfügung gestellt. Die Betten sind bei der Ankunft gemacht. Eine Kaution in Höhe von € 200 ist ebenfalls zu diesem Zeitpunkt fällig. Een verplichte eindschoonmaak van 60 € is vereist voor vakantiegangers bij het overhandigen van de sleutels. Lakens en handdoeken worden gratis verstrekt. De bedden zijn opgemaakt bij aankomst. Een aanbetaling van € 200 is ook verschuldigd op dit moment. A mandatory end-of-stay cleaning of € 60 is required for holidaymakers at the time of handing over the keys. Bed sheets and towels are provided free of charge. The beds are made upon arrival. A deposit of € 200 is also due at this time.